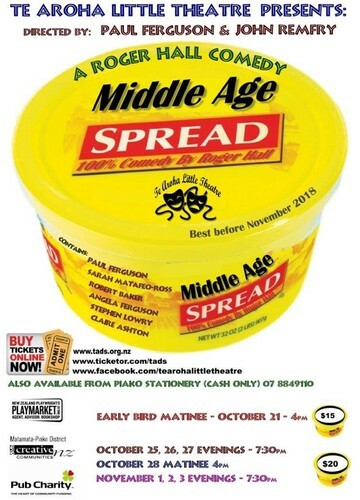 TADS present Roger Halls' classic situation comedy "Middle Age Spread". Paul Ferguson (Run for your Wife) and John Remfry (Four Flat Whites) have combined as Directors to bring you Roger Halls’ wonderful, hilarious Middle Age Spread. Three couples meet for an evening dinner - which none of them really want to be at! This is a comic tragedy about the ordinary lives of middle class, middle aged New Zealanders and there is a little of us all in the plot. Written 30 years ago the issues, personal, national and political are as relevant today as they were then… perhaps even more so! Don't miss this great evenings' entertainment at our lovely Little Theatre in Te Aroha!